Our family of four went on our very first Disney World trip a couple of weeks ago and it was my favorite trip that we’ve ever taken as a family! We arrived on a Saturday afternoon, spent the afternoon and evening at Disney Springs, and then we went to each of the four parks, one per day for the next four days. On our last day, we went to a character breakfast, and then it was time to hit the road and head home. Since there is SO much information and SO many pictures, I’m dedicating a post for each day that we were there and then at the end I’m going to dedicate an entire post to tips, tricks, and specific details about our trip in case you want to plan a trip of your own! Let the Disney recaps begin! Since we live in Georgia there was really no need to fly, so we left home Saturday morning to make the drive down to Orlando. Brian had hooked up the DVD players for the kids, we had a phone full of Disney songs, and we had Mickey Mouse Mad Libs to keep us entertained. The kids mostly watched movies, which allowed me some time to drink my cinnamon tea and read my book, but we did put the Mad Libs and Disney tunes to good use as well! We stopped at a trusty rusty Chick-Fil-A on I-75 around lunchtime to take potty breaks, eat lunch, and to let the kids burn off some energy on the playground, and then we made the rest of the drive down. We arrived mid-afternoon right around 3 PM and headed straight to the hotel lobby to check-in. Easy peasy and perfectly timed! At that point, the excitement was palpable!! The kids were in great spirits despite the fact that they had just been in the car for half of the day, and I was as excited as a little kid! We stayed at Port Orleans Riverside, which is a Disney property. We knew that we wanted to stay on the property so we would have access to the Disney transportation, but we opted to stay at one of the lesser expensive resorts because we knew we would only be in our room to shower and sleep. No need spending a ton of extra money on all of the bells and whistles that we wouldn’t have even used! I will go ahead and tell you this – this was the first of MANY encounters with impeccable customer service that we received at Disney. They must only hire people who love life, love helping others, and genuinely want to be there because I’m here to tell you, every single cast member we encountered on the entire trip was OVER THE TOP kind, helpful, and just plain wonderful. They all bent over backwards to make things special and I just cannot say enough good things about them. We grabbed our suitcases, swiped our magic bands again to get in our room, and then got everything settled in. The room was very basic, with two double beds, a separate sink and vanity, and a separate bathroom, but everything was clean and nice. Since we were staying at Port Orleans Riverside, everything was outdoor “river” themed. Some of the furniture looked like logs, the vanity looked woodsy, and the shower curtain had fish all over it. We got everything settled in, transferred all of our necessities to our book bag that we carried around all trip (I’ll post more on what we kept in the book bag later), and then we set out for Disney Springs. From our resort, we had two Disney transit options to get to Disney Springs – take a boat, or take the bus. Well, it was a gorgeous sunny day with blue skies, low humidity, and a perfect temperature of 75 degrees, so naturally we opted for the boat! We had a very picturesque ten minute walk through the resort grounds to get to the loading dock and then we only had to wait about ten-ish minutes to board. They had some good ol’ New Orleans style jazz playing on the speakers in the boat and it was a very enjoyable ride. I’m not sure how long the ride even was because I was completely caught up in the moment of feeling the warm sun on my face and listening to Louis Armstrong sing Zip-a-Dee-Doo-Dah. It was perfection. By the time we arrived at Disney Springs, it was getting close enough to dinner time to go ahead and grab an early dinner. Our Disney travel agent had scheduled all of our dinners in the parks for the entire trip, but this night was open for us to eat whatever we wanted, so we headed to Wolfgang Puck Express per her recommendation. She told us that they had really good pizza, and boy, was she right! It was DELICIOUS. Since we were on the Disney Dining Plan, we swiped our magic bands, and this meal counted as a quick service meal for each family member. FYI – for all of you Disney goers who will be doing the Disney Dining Plan this year, as of January 2018 all meals on the dining plan now include alcoholic beverages for adults!!!! Yes, that means every adult on the dining plan can get an alcoholic beverage with every single meal! Take full advantage of this, friends! Anyway, since the weather was so darn lovely, we opted to dine outside even though the inside of the restaurant was SO CUTE! B and I enjoyed our pizza and beers and Jacob and Olivia enjoyed their pizza and macaroni and cheese respectively. It was a delicious first meal and the perfect way to kick off our trip! After dinner, we walked around Disney Springs for the rest of the evening taking in all the sights. Disney Springs is the home of loads of shops including a toy store, the largest Disney Store in the world, and a Lego Store, so we let the kids walk around all three. The kids had to take a picture with the Buzz Lightyear statue out front at the toy store! After the toy store, we stopped by the carousel for a ride, and some people in front of us had extra tokens and were kind enough to give their extras to us so we could ride for free! While on the carousel, we saw some friends of ours from back home who go to our church/teach at Jacob’s school… seriously such a small world! After the carousel ride, we headed toward the Disney Store and the Lego store, and on the way, we had to stop and watch the volcano explode at the Rain Forrest Café! Jacob is completely obsessed with volcanoes so he couldn’t get enough of this one! Olivia, on the other hand, was terrified. She buried her face in Brian’s shoulder and covered her little ears. Bless. On the way into the Disney Store, the kids stopped to take a picture with the Cinderella statue, and then we did a little bit of shopping. As I said before, the Disney Store at Disney Springs is the largest Disney Store in the whole world and they weren’t lying!! It was CRAZY HUGE and CRAZY BUSY. The next stop was the Lego Store and on the way in, Jacob wanted to stop and take a picture in front of the huge Lego wall mural. That entire wall behind them is made of Legos just like everything else nearby! The kids also took a picture with a giant Hulk made of Legos, and then we let them each pick one small Lego set to take home. All around the outside of the Lego Store there are lots of big Disney themed statues made of Legos – a huge dragon in the lake, a Buzz and Woody statue, and a humongous Lego statue of Maleficent and the dragon from Sleeping Beauty. I can’t remember exactly how many Legos it took to build it, but I do remember that it was over a million. Can you imagine being responsible for building something with one million Legos?! That would be Jacob’s dream come true! Haha. After we left the Lego Store, we found a vendor selling snacks, and we each got our first of many Mickey ice cream bars and sandwiches! We sat down and rested for a bit and we had a nice view of the big Disney Springs hot air balloon! Yes, you can go up in it, and no, I did not want to. EEK! After our snacks, we watched the volcano erupt one more time (this time from across the lake so as to not terrify Olivia again), and then we let the kids head back to the very first toy store that we had shopped in to let them each pick out one small souvenir. By that time it was well after 9:30 PM so we made our way through a different area of shops on the way to the bus stop. We thought about taking the boat back to the resort, but it was so late already and it was getting chilly, so we decided it would be easier and warmer on the bus. Olivia passed out within minutes of boarding the bus, and B had to carry her back to our room. As soon as he put her down when we walked in the door, she immediately climbed up on the ledge above the air conditioner and was out again. Lol. 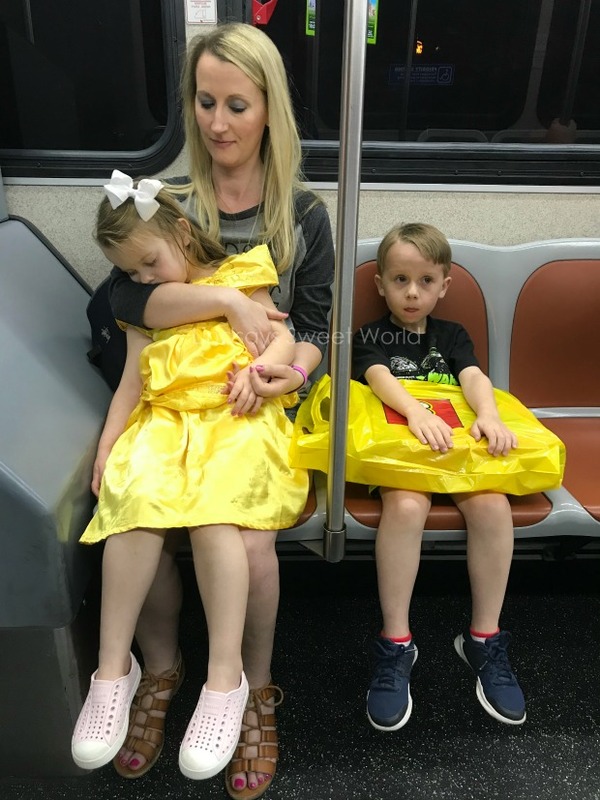 We hadn’t even made it to the parks by that time and we were all whooped already! We immediately hit the hay to prepare for Day 2 at Animal Kingdom, and I’ll be recapping that on Thursday! OH this brings back so many memories! We stayed at P.O. Riverside the last time we went to Disney and it was wonderful! We went for Ella's 7th birthday. I have been to Disney, countless times, and NEVER had a negative experience. It has always been "Magical"
We use to be good friends witha a couple that were Disney Characters. She was was Mickey and he was Goofy. It was so cool to hear about their experience working for Disney! LOVE this! The Hulk of Lego's is my favorite!! The mural is awesome too. I am such a bad mom, we never took our kids but someday will take them and all their families. Whew, that could be awhile, lol. And the Mickey ice cream bars with ears!! Love your send off photos with the letter board! Eek, I am so excited to see more!!! Ahh what a fun first day!!! I love that you could take a boat to Disney Springs! What a great way to kick off the trip! I loved following along on instagram and the details behind the insta posts are awesome! I was only to Disney once, when I 7, and it really does sound like a magical place! Oh my gosh - this was so fun to read and I’m patiently waiting for the next recap! Your resort looks so beautiful! We never witnessed the volcano at DS. Ahhh! There’s soooo much to do and see. That picture of Olivia passed out is hilarious. If that doesn’t say,”A day at Disney,” then I don’t know what does! Eeekk! This post makes me oh SOO happy!! Disney is my most favorite place in the world. Growing up from the time I was 3 my family vacationed there every year and I never once got tired of going. I think I have been about 33 or 34 times now! haha We can't even imagine vacationing anywhere else with our girls. I can't wait to see the rest of your vacation pictures! It looks like Day 1 was a success and everyone had fun!! I can't wait to see the rest of your pictures! I'm so glad you had a great time. Also, I can't believe that lego dragon is still there. I think it has been there for years! Haha. Yeah somebody else was telling us that as well! I love taking the first day out of the parks to go to Disney Springs and get in that Disney feeling! Ahhh sounds like the first day was such a success! I love Disney and it's fun to see how much has changed over the years! What a great time. My parents just went to all of these parks, so it is fun to see the differences and what you all experienced. Preps us for our trip in a year and a half. How fun! I want to go there one day, now to get Mr. on board! He hates amusement parks! Such a great time, can't wait to see the other recaps! Disney Springs is one of our favorite places to visit! I agree - Disney employees are the BEST. They really are! They're like Chick-Fil-A employees but even better! Haha. This is so fun! I have never been to Disney Springs, I am pretty sure it did not exist when I last went. So fun to read and there is nothing better than the anticipation of the first day of vacation :) Love it! How much fun!!!! We hope to get there sometime soon-ish, so I love reading and getting tips from everyone. SO much fun! We often stayed at Port Orleans too and I just love that lazy boat ride to Disney Springs. Yes, it was fantastic!! It was one of my favorite parts of the trip. It was just so peaceful. How fun!! You're getting me in the Disney Spirit!!!!! :) I need to take a trip- my husband hasn't been!! Yes, y'all totally do need to go! Everybody needs to go at least once! Aww I stayed at Port Orleans when I was little! Fun fact - it was around Easter too, and I found the golden egg at an Easter Egg hunt! I won a bunch of great stuff from their gift shop. Love your first day! I am loving your Disney posts! We are going in October for the first time so I'm trying to get all of the information I need. Which dining plan did you use? Yay! You guys are going to have so much fun! We did the standard dining plan - that's the one that includes one quick service meal, one table service meal, and two snacks per person per day. I'm going to do a post in a couple of weeks with all of my advice, tips, and tricks so keep reading! I'm sure you'll find that it's really helpful! Yay! I love Disney posts! Did you happen to try the beignets at Port Orleans Riverside? They are delicious and the only place you can get them at Disney World! Noooo, we didn't!! I had no idea that they even had those there! That would have been so great to try!